We are having more unseasonable warm weather (70 degrees in the afternoon) so I decided to prep and prime some parts. 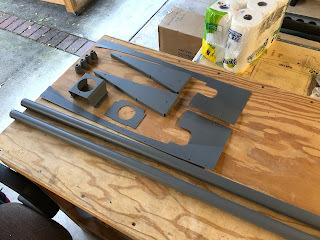 Here are the aileron push rods and end caps, the GMU-22 magnetometer mounting bracket, wing tip ribs and the elevator gap closure fairings. I also spent some time cleaning up the garage some. 1) The FlyLEDS wingtip LED strobe lights may be electrically noisy so it is recommended that they be wired using a shielded pair of 18-22 ga. wire. 2) I will be installing a GAP-26 regulated pitot heater that requires additional wiring runs for power and the sense line that attaches to a G3X annunciator. 3) I think I'll be mounting the outside air temperature (OAT) in the left wing and it will require extra wiring. 4) I am going to use an Archer nav antenna embedded in the right wing tip and it will require a coax cable run.